To ensure that the ATC units and airspace structure provide acceptable workload for the ATC as on Advisory Circular (AC) 170-02 regarding Capacity Management. To review its oversight and to ensure flight crew actions to respond properly the aircraft system waming through adequate training. To ensure that all aircraft operated under IFR should be conducted with respect to a published minimum safe flight altitude. To provide the crews with sufficient aeronautical information. 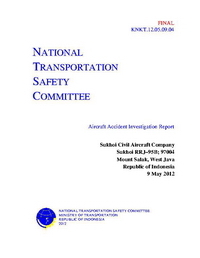 To provide the crews with sufficient aeronautical and other necessary information to the crewmember prior to perform flight outside published airway including obstacle and terrain information. To review its current demonstration flight practices and ensures the compliance to the flight procedures during demonstration night. To review its oversight and to ensure flight crew actions to respond properly the aircraft system warning through adequate training. To ensure that all aircraft operated under IFR should be conducted with respect to a published minimum safe t1ight altitude. To review its oversight and to ensure that all ATS provider comply with the requirement of MSAW and the minimum vectoring altitude being integral part of radar service. To review its oversight and to ensure that all ATS provider follow with the requirement of Advisory Circular (AC) 170-02 regarding Capacity Management. To review its oversight and to ensure that all approved Ground Handling comply with regulatory documentation keeping in regard to crew and passenger manifest.